I'm not sure what to say. Everything is orange right now. I don't even like orange, ordinarily, but these two orange skeins of yarn sat on the shelf insisting that I buy them, even though I had no plan for them whatsoever. This Madelinetosh Tosh DK in Gilded wanted to be Ripley, despite being absolutely the wrong gauge and a color that works not at all with my black coat. Unless it's Halloween or something. I used US 8 needles and worked the edging until I had 56 slipped stitches, then increased until I had 84 stitches. I worked 12 rounds between the pleats, and made them a little wider. 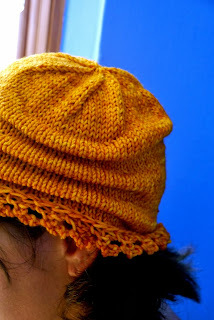 I worked 5 rounds before starting the crown decreases--I definitely didn't want it to be slouchy, but I didn't want it to be too short either--and there you are! It all worked out. The Malabrigo lace in Glazed Carrot sat around in my trunk for a year and a half, which is practically unheard-of. And so I made another one of what Dave calls my Laughable Knits--I knit things that aren't actually all that warm. (Hello, Fair Isle Yoke, Faith, Molly Ringwald, Cherry, Rusted Root, and Butterfly). Well. Here's another. Whisper, in Size Small, knit as long as I could before getting bored, and for a tiny sweater with basically no front it took forever, but it is fun and looks great with everything and hey, even if it isn't all that warm, it's still very fuzzy and soft. I like your orange autumnal knits... the cardy is lovely! As is the twirly dress!